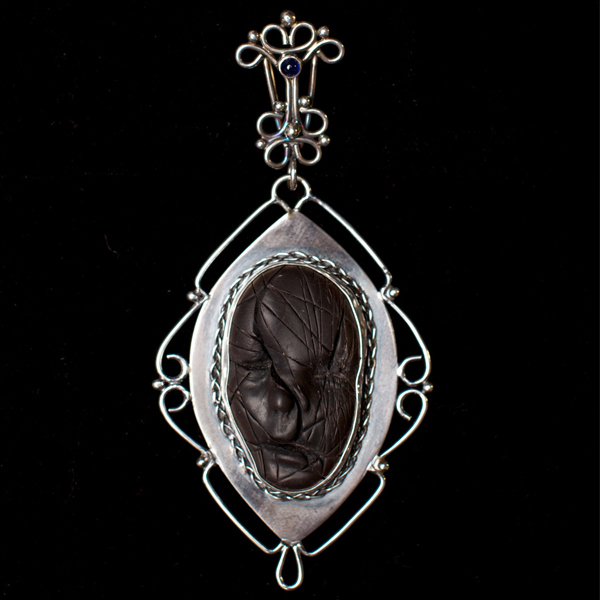 This pendant was the birth of Creepy Cameos. Jason gave Ursula the face as a present one year. Ursula kept it on her bench for quite some time wanting to set it in a handcrafted setting. 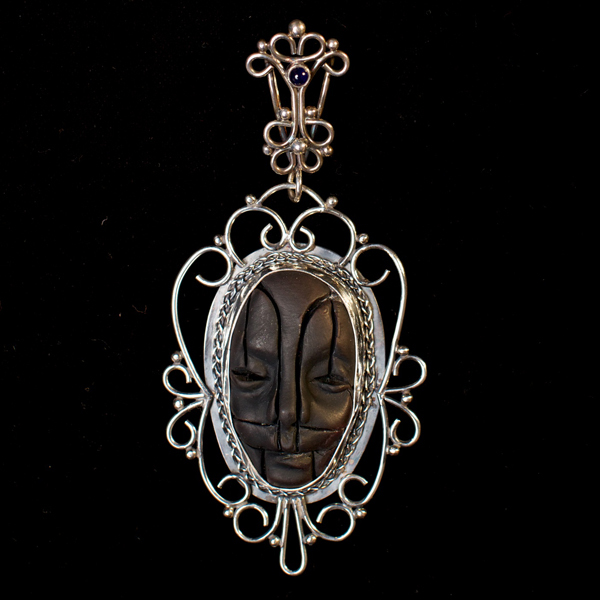 When the inspiration arose, this Cameo was produced and Ursula began receiving many complements on her new pendant, and so she asked Jason if she could pick out a new face to set in silver. Jason let her dig through his box of faces and pick out a new face. 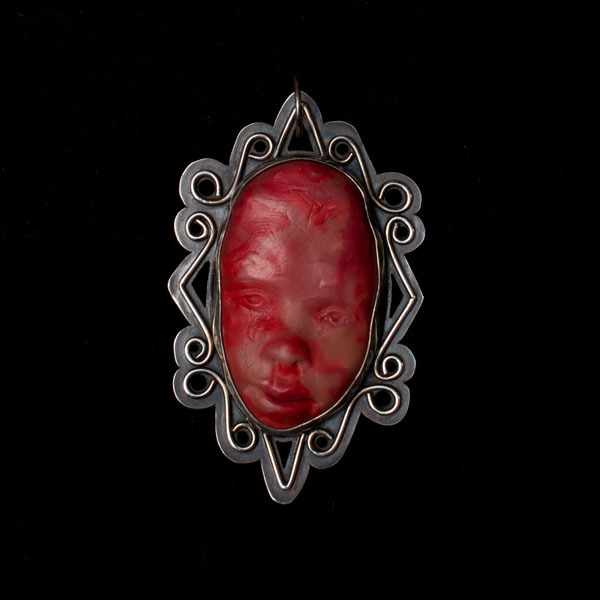 They both have a passion for vintage cameos and the macabre, thus it great fun for them to combine the two. 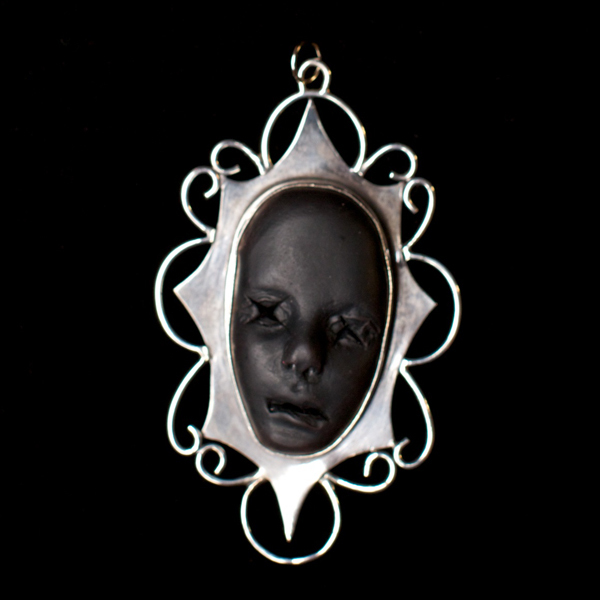 The setting is constructed in Solid Sterling Silver and the face is sculpted in polymer clay. Each piece has been hand crafted, and is one of a kind. Get one for yourself or for Gift giving today before it’s gone!! 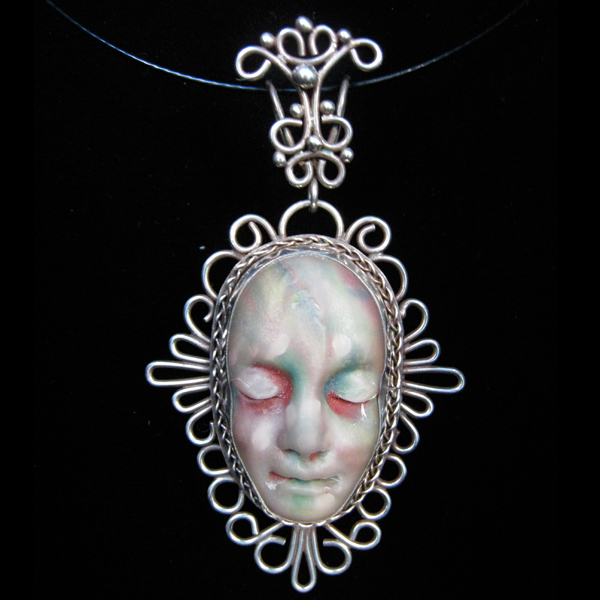 .The setting is constructed in Solid Sterling Silver and the face is sculpted in polymer clay. The setting is constructed from 45 separate pieces of silver wire and sheet and is precisely mitered together to give it a lacy look. The face is has a marble appeal with different shades of green and purple. 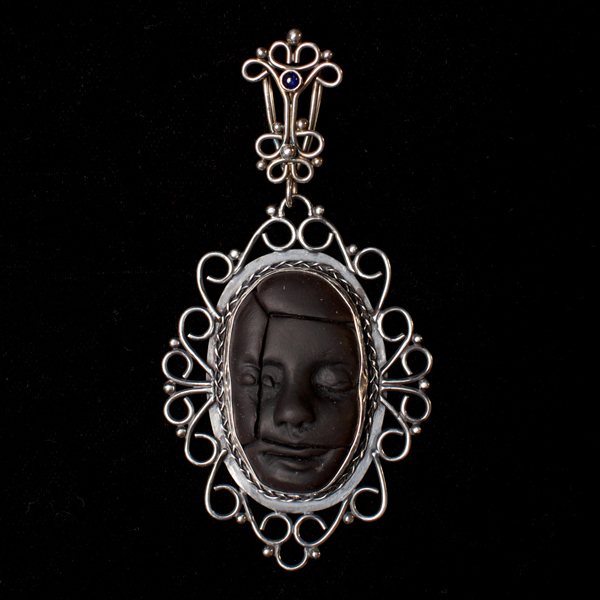 This piece has been hand crafted, and is one of a kind. It hangs on a 18″ 1.1MM black cable wire with a magnetic clasp that is easy to latch. The setting is constructed from 15 separate pieces of silver wire and sheet which are precisely mitered together to give it a lacy look. The face is a rich black with Xs in the eyes. The setting is constructed from 31 separate pieces of silver wire and sheet which are precisely mitered together to give it a lacy look. 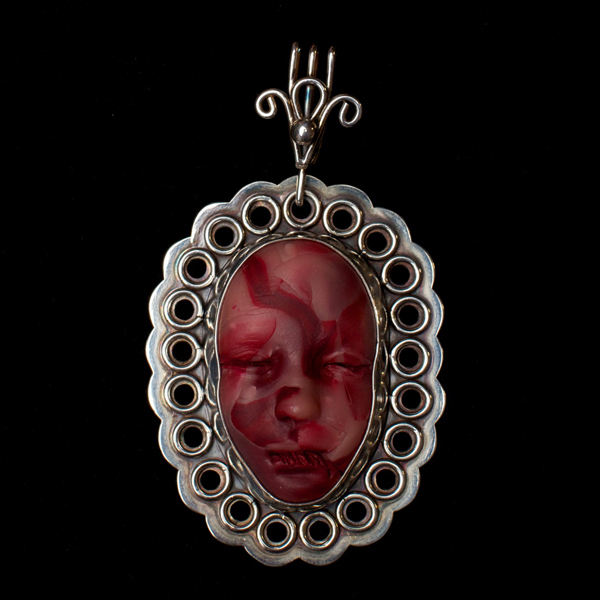 The face is has a marble appeal with different shades of red and pink. The setting is constructed from 36 separate pieces of silver wire and sheet which are precisely mitered together to give it a lacy look. The bail has a 4MM Blue Sapphire in a tube setting. The face is a rich black with lots of slash marks. The setting is constructed from 52 separate pieces of silver wire and sheet which are precisely mitered together to give it a lacy look. The bail has a 4MM Blue Sapphire in a tube setting. The face is a rich black with scribed architectural lines. The setting is constructed from 31 separate pieces of silver wire and sheet which are precisely mitered together to give it a lacy look. The bail has a 4MM Blue Sapphire in a tube setting. The face is a rich black with architectural scribed lines.